LAST WEEK, amid the disturbing string of high-profile suicides — fashion designer Kate Spade, celebrity chef and author Anthony Bourdain, the younger sister of Queen Maxima of the Netherlands — came news of the death of a Honduran migrant who was separated from his family and thrown into detention. Marco Antonio Muñoz killed himself last month in a padded isolation cell in Texas. The death, previously undisclosed by the government, exposes the tragic human toll of President Trump’s new “zero tolerance” policy at the border. That action — criminally charging adults for crossing illegally while taking their children away from them — represents perhaps the most inhumane, un-American, and vicious of Trump’s policies. In separating families, the US government may be found by the courts to be violating their rights to apply for asylum. Will other branches of government force the administration to operate within the bounds of decency? According to a Border Patrol agent, Muñoz, his wife, and their 3-year-old turned themselves in at the border after crossing illegally and then declared their intention to apply for asylum. When Border Patrol agents told the family they would be separated, Muñoz “lost his [expletive]” and they had to “use physical force to take the child out of his hands.” Less than 24 hours later, he was found dead in his cell. The policy is inflicting emotional trauma on hundreds of families whose children end up in secretive shelters at the border for months, or living with foster families all over the United States, as reported by the Globe’s Liz Goodwin in heartbreaking detail. More than 650 kids were separated from their parents in the first two weeks after the policy was officially adopted, in early May. According to a lawyer from the Justice Department, once a parent is in federal custody and the child is funneled into the Department of Health and Human Services system, the government does not try to reunite them. The Trump administration is pursuing this as a form of deterrence, sending a perverse message: Migrants shouldn’t “recklessly and improperly” bring children across the border if they don’t want to be separated. It is “a brand of justice that seems un-American to many, unrecognizable in its deliberate cruelty,” Goodwin writes. In throwing the moms and dads in jail while taking away their children to live in shelters, the government is stepping on the rights of migrants who may have a legitimate claim of asylum. “To obtain asylum through the affirmative asylum process you must be physically present in the United States,” according to the US Citizenship and Immigration Services website. One may apply for asylum here regardless of current immigration status or form of arrival. Media reports said Marco Antonio Muñoz became combative after learning that his family would be split up. Meanwhile, where does Congress stand on this? 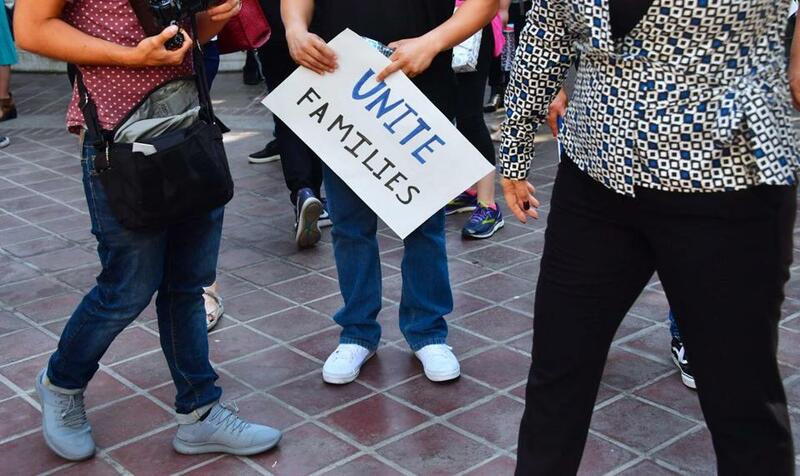 A group of Senate Democrats filed a bill last week to prevent the US Department of Homeland Security from taking children from their parents at the border. Congress has an opportunity, and an obligation, to stop these acts of suffering. Will it?